Vinyl fence installation can be time consuming, but when done right, your vinyl fence can last for years completely maintenance free. There are dozens of types of fencing and property markers on the market today. So why choose a vinyl fence over wood or metal? Vinyl fencing is maintenance proof. No scraping, painting or replacing of rotting or rusting material over the years. Once a vinyl fence has been properly installed, you can sit back and enjoy the beauty of a picket fence, without any of the work involved. Not all vinyl fences are created equal. If you are looking for one that you can install yourself, and that is as maintenance free as possible, be sure to look for the following attributes. While recycled materials are great for the environment, they aren't so great for your vinyl fence. Look for a fence made of first run materials to know you are getting uncompromised quality in your fence. 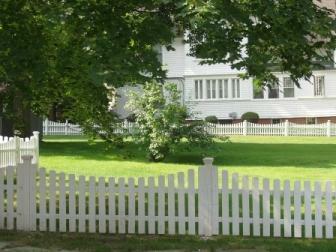 Select a vinyl fence that is at least 4-inches thick on the end posts. This is important if you want to avoid an extra step of reinforcing your fence with wood posts during installation. Look for a true gate with a steel or aluminum frame. This will prevent your gate from sagging over time, while allowing you to hang it squarely from day one. Installation of your vinyl fence is going to depend on several factors, including the type of terrain, how level it is and what type of fence clips you have. Vinyl fence installation is definitely a two-person job, so be sure to get help before you begin. You are going to need to reinforce your posts every 7 - 8 feet with rebar and concrete. This means inserting a two to four metal, rebar posts inside the vinyl post and then filling the post with concrete. The concrete and rebar will extend below the fence post into the ground an extra foot to securely hold your fence in place. If you are installing your fence on top of existing concrete, you'll still need to rebar your posts, but you'll use the existing concrete rather than fresh. Make sure you order shorter, above ground posts for your fence. You'll need to drill holes into the concrete that will fit the rebar. Insert the rebar into the vinyl fence post and then anchor the post to the concrete using the rebar. Make sure your holes, and the rebar extending down from the post are at least 4-inches for maximum support. To keep the rebar positioned correctly inside your vinyl posts, you'll need to pick up some rebar separator clips. The clips will attach to the rebar, holding it steady in the 4 corners of your vinyl post. The pressure the clip exerts will keep the rebar firmly against the corners, holding the post upright. Clip your rebar together before you slide it into your post. Now the post can be filled with concrete, or the rebar mounted into a concrete pad and the post will stay upright. Before you can anchor your fence and hang your gate, you'll need to put together the basic fence frame. Your vinyl fence will come pre-notched at the correct places; use a drill to lock the pieces together and hold them tight. The rails will fit and snap into one another on the frame, making this the easiest part of the installation. Once the frame is together, you can sink your posts into the ground and snap the rails in place. If you are installing a gate on your vinyl fence, make sure you reinforce both posts on each side of the gate with rebar and concrete. Next, attach the hinges making sure they are completely level and square so your gate doesn't sag. Attach the locking mechanism to the post first and the gate itself second to ensure proper placement. Vinyl fence installation should be undertaken slowly to ensure each step is carried out properly. While vinyl snaps together easily, and the frame is assembled quickly, taking the time to clip the rebar and concrete the posts is essential. Follow the manufacturer's recommendation for depth at each fence post, as this will vary with the height of your fence. Choose and install a vinyl fence around your property for maintenance free beauty that will last for years.